Edge4Vets allows veterans to meet face-to-face with hiring managers. 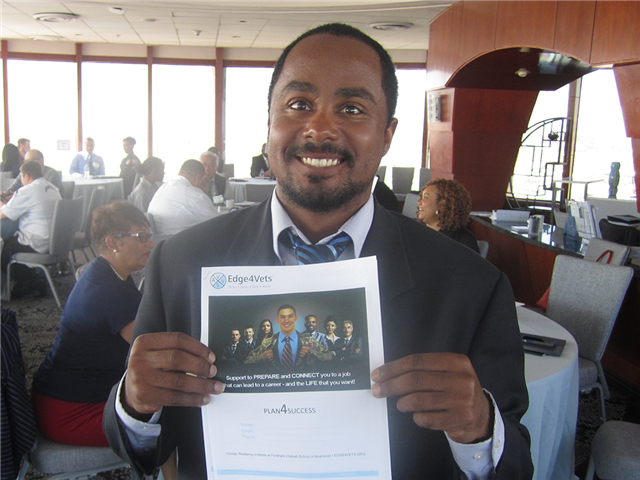 Edge4Vets participant Jorma Kenney at last year's seminar displays his PLAN4SUCCESS. Last year, provisional job offers and interviews were extended to more than a dozen veterans attending the seminar. "Through their service to our country, veterans have gained experience in leadership, ingenuity and dedication to mission, providing a great foundation for success in their next career," said Paula Adams, Director of Airports Administration, LAWA. "Edge4Vets pairs veterans looking for new job opportunities with employers who know that their skillset can provide great benefit to their organization, and we hope that those veterans looking for employment or to hone their interview skills will register to attend this career development program." “Edge4Vets gives vets what business leaders say they need most: support to translate their military skills before we connect them to jobs that can lead to life-long careers in aviation,” said Tom Murphy, Founder, Edge4Vets. The Edge4Vets program consists of two components: preparing veterans for the interview process by helping them identify and discuss their skills in HR-friendly terms, and connecting them with hiring managers, HR professionals, and other job opportunities through future seminars, referrals or other relevant events. Veterans can register for the May 15 seminar at www.edge4vets.com by following the link to the event’s registration page. From there, applicants will create their PLAN4SUCCESS, a document that works as a tool to help veterans evaluate and identify skills and values relevant to hiring companies. Applicants will take their plans to hiring managers for feedback and revisions on the day of the seminar, which has led to veterans receiving critical feedback, constructive suggestions, and even job offers. Following the seminar, the PLAN4SUCCESS is given to attending hiring managers for further consideration and evaluation. The Edge4Vets program began its partnership with LAWA in 2017, and has led to fulfilling jobs for a number of veterans who completed the module and attended the seminar. The program is offered by the Human Resiliency Institute at Fordham University in New York in partnership with Airports Council International-North America, and is collaborating with schools and veterans' organizations throughout Southern California to raise awareness of the workshop. For questions about the program, please contact Tom Murphy at [email protected].